Shenzhen topped Beijing to cut the deficit in the series. Leopards made 22-of-27 free shots (81.5 percent) during the game. Leopards outrebounded Beijing Ducks 49-38 including 16 on the offensive glass. 29 personal fouls committed by Beijing Ducks helped opponents get some easy free throw opportunities. It was a great evening for American point guard Dwight Buycks (191-89, college: Marquette) who led his team to a victory scoring 35 points (!!!) and 5 rebounds. International center Zijie Shen (205-97) helped adding 13 points and 15 rebounds. Leopards' coach Jianjun Wang used an eleven-player rotation which allowed the starters a little rest for the next games. The best for the losing side was American guard Aaron Jackson (190-86, college: Duquesne) with 27 points, 5 rebounds and 9 assists and Croatian-American center Justin Hamilton (213-90, college: LSU) scored 25 points. Both teams had five players each who scored in double figures. Guandong outgunned Jiangsu to sweep the series. Guandong Tigers dominated down low during the game scoring 82 of its points in the paint compared to Jiangsu Dragons' 54 and made 17-of-22 free shots (77.3 percent) during the game. Guandong Tigers forced 20 Jiangsu Dragons turnovers and outrebounded them 50-31 including a 18-4 advantage in offensive rebounds. Guandong Tigers looked well-organized offensively handing out 33 assists. 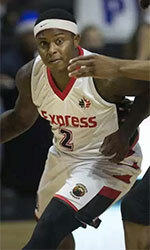 24 personal fouls committed by Jiangsu Dragons helped opponents get some easy free throw opportunities. It was a great evening for American swingman Sonny Weems (198-86, college: Arkansas) who led his team to a victory with a double-double by scoring 18 points, 5 rebounds, 14 assists and 4 steals. 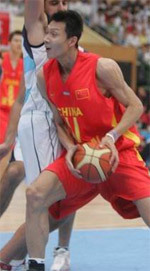 International forward Rui Zhao (193-96) helped adding 26 points and 4 steals. Five Guandong Tigers players scored in double figures. The best for the losing side was Serbian center Miroslav Raduljica (213-88) with 29 points, 8 rebounds and 5 assists and American guard Donald Sloan (190-88, college: Texas A&M) scored 28 points and 6 assists. The winner was already known earlier in the game, so both coaches allowed to play the bench players saving starting five for next games. Liaoning beat Fujian to clinch the semifinal berth. Flying Leopards had a 19-7 advantage in offensive rebounds. It was a great evening for American Lester Hudson (190-84, college: UT Martin) who led his team to a victory with a double-double by scoring 27 points, 11 rebounds and 5 assists. The former international Ailun Guo (192-93) helped adding 32 points, 5 rebounds and 5 assists. The best for the losing side was international Zhelin Wang (214-94) with a double-double by scoring 29 points and 13 rebounds and American-Ukrainian point guard Eugene Jeter (180-83, college: Portland) scored 20 points and 7 assists. Four Flying Leopards and five Sturgeons players scored in double figures. Both coaches used bench players in such tough game. Guangsha rolled past Xinjiang to stay alive in the series. Zhejiang Guangsha Lions forced 20 Xinjiang Flying Tige turnovers. They looked well-organized offensively handing out 29 assists comparing to just 16 passes made by Xinjiang Flying Tige's players. 28 personal fouls committed by Xinjiang Flying Tige helped opponents get some easy free throw opportunities. It was a great evening for American point guard Courtney Fortson (180-88, college: Arkansas) who led his team to a victory with a double-double by scoring 21 points, 5 rebounds and 17 assists. Taiwanese guard Chih-Chieh Lin (192-82) helped adding 27 points, 6 rebounds and 5 assists. The best for the losing side was American forward Jarnell Stokes (201-94, college: Tennessee) with a double-double by scoring 27 points and 12 rebounds and international Abudushalamu Abudurexiti (203-96) produced a double-double by scoring 19 points and 13 rebounds. Five Zhejiang Guangsha Lions and four Xinjiang Flying Tige players scored in double figures. Xinjiang Flying Tige's coach rotated ten players in this game, but that didn't help.